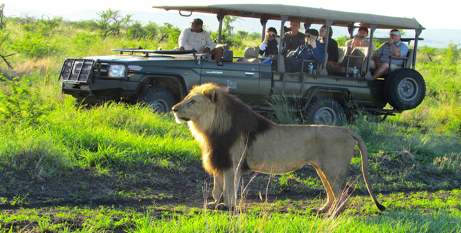 During our recent visit to Tau Game Lodge, our expectations were exceeded many times over. The rains had come early and the malaria-free region was clad in picture-perfect green. The spectacle of myriad game at the waterhole, which is visible from all room and hospitality decks, proved highly addictive. The newly opened Reception, Lounge, Dining Room, leisure decks, Bar, Boma and two pools, of which one is an infinity design, is the stuff leisurely safari dreams are made of. Luxurious accommodation at Tau Game Lodge. On arrival at our Room 4, a Luxury Room, one glimpse of the waterhole from our private deck convinced us this would be the place to relax our travel-weary bodies after lunch. We were captivated by the pecking order right up to twilight, when reflections in the water of game parading at cocktail hour made for magical photographic memories. The lodge is enclosed within the reserve, resulting in the humans being subtly fenced in, while game, including several crocodiles, roam free in this safari haven, including the prolific bird life. Dinner in the boma on our first night made for convivial memories, complemented by wholesome South African food, including chicken curry, succulent lamb chops, pap (firm African porridge) with chakalaka (chef’s special recipe of tomato and onion gravy). As for dessert, my hot favourite, baked ginger pudding with fresh cream, hit the spot. Dietaries are catered for on request. After a gloriously deep and satisfying sleep, it was time to arise for the 5,30am game drive. What a thrill. Ernie, our game ranger, knows his turf and not only did his knowledge of the game, their proximity and habits impress us, but also his respect for the bush in allowing the creatures of the wild their space. Within minutes, we were photographing aged bull elephants, delicately foraging and breakfasting on new green flora after the rains, then white rhino and their young. Ernie parked in a spot known as Ernie’s Golf Course, from where we could observe further game while savouring Amarula coffee and delicious buttermilk rusks. On our return to the lodge for breakfast, we came across two young lion, sleeping in the road. A concerned German guest whispered, “are they dead?” Our vehicle came to a quiet halt, where another Tau safari group was already parked alongside to observe this early morning catnap. 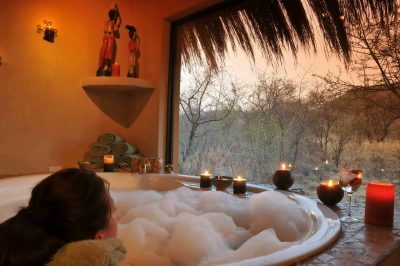 Relaxing in the spa bath at Tau Lodge in Madikwe. 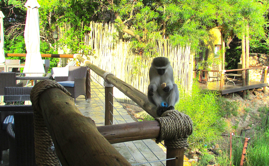 Breakfast for the humans was a jolly affair on the modern Out of Africa- designed dining deck as guests were on a high after the wealth of game sightings on their morning safari. Here, again, we lingered as vistas of game at the waterhole proved mesmerising for all. The Tau Cubz Club, Tau Spa Oasis and Tau Conference Centre make this an ideal destination for family, leisure as well as corporate travel. Tau Game Lodge opened its 5-star safari doors in 1995 and offers 30 rooms, from Standard to Luxury to Family Suites.